Calls to ban dog meat in the UK after suspicions some are EATING dogs in the dog-loving nation. Calls on the UK government to ban the consumption of dogs have been brought to the attention of Theresa May after growing suspicions that dogs are being eaten in the country. The practice of dog-eating is prevalent across South-east Asia and the Hong Kong-based organisation, World Dog Alliance, have highlighted concerns to UK politicians that there may be an increase of dog eating in the UK, amid fears that it may be spreading across the world. The Dog Meat Trade, more aptly known as the Dog Torture Trade due to the cruel and barbaric methods employed to kill the dogs in countries such as China, South Korea and Vietnam, is a widespread practice across the far-east, much to the devastation of the millions of Asian dog lovers whose calls to ban eating dogs in their own countries have fallen in deaf ears. 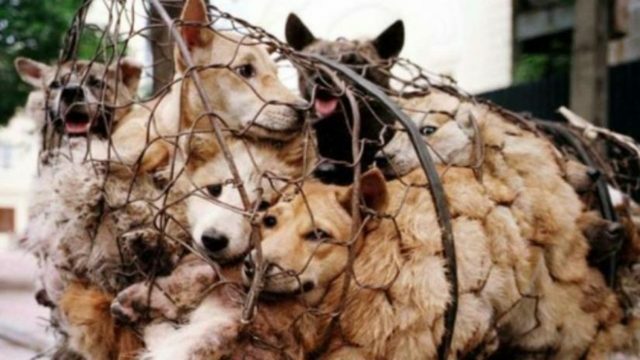 Reports that both Egypt and Malaysia have recently agreed to send their stray dogs to the barbaric trade in South Korea and China have similarly caused grave concern among dog lovers and advocates across the world, suggesting – contrary to reports – that the trade is growing, not shrinking. The barbarism and cruelty of the trade is further intensified by the fact that 70% of these dogs are stolen pets, snatched from their owner’s gardens or homes; it is not uncommon to find bloodied collars scattered across slaughterhouse floors which once belonged to a beloved family pet. That this devastating practice, still hidden from much of the international public, may be spreading to countries where dogs are widely viewed as friends not food is one that has provoked outrage from both the public and politicians alike. Sir Alan Duncan and Dr Lisa Cameron MP are just two politicians who have spoken out against it and are calling on the Prime Minister to implement a ban on dog meat in the UK. While it is illegal to buy or sell dog meat in the country, it is not illegal to humanely kill a dog you own and eat it. This loophole in the law has come as a surprise to much of the British public, who find the idea of eating dogs abhorrent, but both advocates and politicians alike believe that a complete ban would not only clamp down on any potential nefarious activities in the UK, but also send a loud clear message to those across the world that torturing and killing a dog for food – particularly a pet – is unacceptable. Some may argue that the Dog Torture Trade is cultural, but this is a falsity peddled by dog butchers whose one and only concern is financial; many advise that there is nothing cultural about the trade, particularly with the cruelty involved. “The commercial trade in dog meat in the UK is illegal, but we will look closely at the decision taken in the US. “Britain is a nation of animal lovers and we continue to have some of the highest animal welfare standards in the world. Such a ban would undoubtedly send a clear message to dog-torturing nations that this barbaric practice is unacceptable in the 21st century. A ban on eating dogs in the UK looks imminent, with overwhelming backing from the public and staunch approval from politicians. Next articleHidden Gems of London Series: Brentford – The Battlefield of London. The eating of dog’s and cat’s needs to be banned in all countries this is so barbaric. More so in Asia. But to get them to stop the UK needs to ban it. Needs to stop NOW, these are loving feeling beings who suffer just like we do! ‘Mans best friend’ is what they call dogs because of the unconditional love they give us if allowed! This is no way to treat these souls, in fact what gives us the right to treat any animal this way! We must nip this in the bud now, before it has a chance to escalate. The UK will not tolerate a dog meat industry. We are a civilised country with animal welfare laws, not like some in South East Asia where the dog meat trade is a hideous, evil, exceptionally brutal torture. How people, « human being » can be so much inhumane as never !!! WORLD KNOWS WHAT IS HAPPENING IN CHINA AND WE’LL NOT LET YOU DO THIS FOR LONG !!! !